Why? Well, it could be that we are happy to wash and style guests hair all day long. It could be we are desperately trying to protect our color (if you remember from last month’s blog we are lowest on our own priority list). It could be we don’t always have time. We all lead very full lives outside of the salon. Or it could be we just enjoy the gritty, grippy feel of dirty hair. I can say with certainty that is my druthers. I am well aware there are individuals out there that feel not washing your hair every day is gross (my mom and my sister are two very prime examples). It isn’t for everyone. Dirty hair feels different and looks different and it most definitely is not for people that like to load up on product post shower. If you plan wash days and product strategically, it is easy to milk a few days out of a style. I’m not saying don’t wash your hair EVER. There is a difference between skipping a shampoo and not being clean. Skipping a wash day allows your natural oils to nourish your hair. It also helps protect hair color from its #1 enemy, water (because of the minerals found in tap water) and gives the hair more protection from heat tools, in addition to a grippy texture. Day 1: Shampoo. I have a shower full of various shampoos (who’s a hairstylist?) so I’ll select the one that will benefit my hair the most over the course of a few days. This means I look at the weather report. Hot and humid calls for something that will help give me a little oomph and get my hair clean. Wintertime temperatures see me using something a bit more nourishing. I rotate regularly through Aveda Color Conserve Shampoo, Brilliant Shampoo and Smooth Infusion shampoo. I generally follow the same rules for conditioner. My favorites as of late are Color Conserve Strengthening Treatment, Cherry Almond Softening Conditioner, Blue Malva (gotta keep the blonde bright and brass free!) or Smooth Infusion. The next step is product. Once I have towel dried my hair (blot your hair – don’t scrub it!) and 30 to 40% of that soaking wet feel is gone, I will add a small amount of Aveda Color Conserve Daily Color Protect (a leave in conditioner – gotta keep that color pretty!). 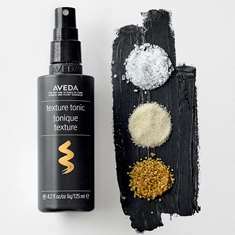 I will follow that with my favorite Aveda Holy Grail product Aveda Pure Abundance Style Prep. I add about 15 to 20 pumps. Then depending again on the weather I will add either 10 spritzes of Texture Tonic or three-ish pumps of Phomollient. All of these products are light and texture building. I don’t like to use anything to heavy as my hair will get flat and oily too quickly. I blow dry and then flat iron my ends under. I’ll finish with a wee bit more Texture tonic to give separation. Day 2: On day two my hair is a little weighty and has some grip to it. This is the day I will add an emollient finishing product (see paste, wax cream, gloss) to it. My go to is the Aveda Men’s Grooming Cream. It gives me texture and separation but still manages to be lightweight in the hair. I will reshape my hair with the flat iron and then add the cream for piecey-ness. And that dear reader is day 2 DONE. Day 3: Day three is relatively similar to Day two – except I have even MORE texture. 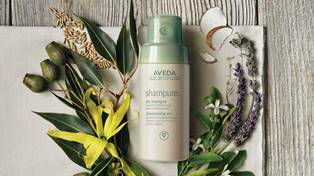 If my scalp looks a bit oily I will put in some of the Aveda Shampure Dry Shampoo and fluff. Again, rounding the ends under with a flat iron and finishing with a bit of the Men’s grooming cream. And that’s it kids! Obviously I have selected these products because it is what I have come to love via trial and error. My hair is super straight, color treated and I have TONS of it. Your product selection will vary based on your hair type and texture and obviously your styling will too. Any one of the stylists here at Enso would be happy to offer their advice and product knowledge for making your hair look awesome several days post shampoo. This is a dirty little secret that’s too good to keep to ourselves.